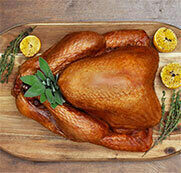 Canadian turkey is available in various cuts that offer variety and versatility all year round, and for every meal. See how well turkey pairs with different flavour profiles to provide you with quick, tasty and nutritious every day meals. Look for it in your grocery store.